Mattel realizes that nutty toy collectors would indeed buy the hell out of this thing, and announces that it will be available as a Comic-Con exclusive. Zealous toy flippers line up at Comic-Con to buy the hell out of this thing for $5 a piece. Zealous toy flippers immediately flip their loot on Ebay. Nutty toy collectors buy the hell out of the non-toy on Ebay for upwards of $20 a piece. Everyone profits. Oh. Except for the nutty toy collectors. Who–as always–spend frightening amounts of money funding their Peter Pan syndromes. I guess it would just be too logical to actually make a jet toy out of clear plastic, right? 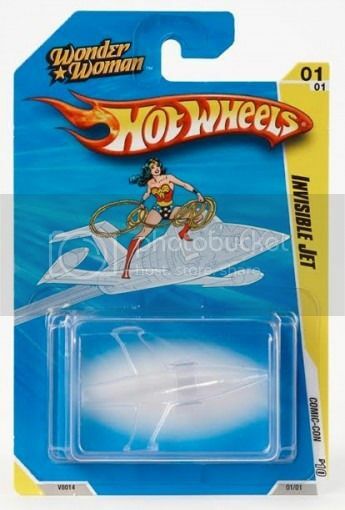 That’s hardly an invisible jet toy. It’s more of an intangible jet toy. The original joke premise isn’t bad, but I’ve got to agree with ThePirateStar — a clear jet toy would’ve made a lot more sense. Well, it would’ve made as much sense as Wonder Woman’s invisible jet ever made.